Being a makeup junkie, I find it crazy that I haven't actually tried a whole lot of concealers. I've probably sampled less than ten concealers since I started loving makeup. From the small amount that I've used and tested, I keep a small rotation of products that I know I love and trust. I have two of my holy grails by Maybelline. The Age Rewind and Fit Me Concealer have been my ride or dies for pretty much the past year or so. I like to use a mix of both on my under eyes then just the Age Rewind to highlight the rest of my face (bridge of my nose, forehead, chin). A lot of people say that the Fit Me concealer is a dupe for the Nars Creamy Concealer. I've actually tried the Nars concealer but I still prefer the Fit Me over it. I've had the MAC Pro Longwear Concealer for the longest time now. I actually really like it but I haven't been reaching for it as much as I used to. It was my go-to concealer before I found that mixture of the Maybelline concealers worked better for me. It has great coverage. I do have one problem with this though. For some reason, this product pairs up better with the Ben Nye Banana Powder as opposed to Laura Mercier Translucent Powder. I find that I get crease-y when I use anything other than the Banana Powder (which is also a reason I don't reach for this much anymore). I'm just trying to finish it up which is why it's in my rotation. Another product in the rotation is the MUFE Ultra HD Concealer (review). I like to use this to highlight parts of my face. I bought a fairly lighter shade than usual and it does a great job at brightening areas that I need brightened. I like that this concealer is light in formula because it's easy to blend into the face. Though it's light, it does have really great coverage and does not crease into any fine lines on my face. 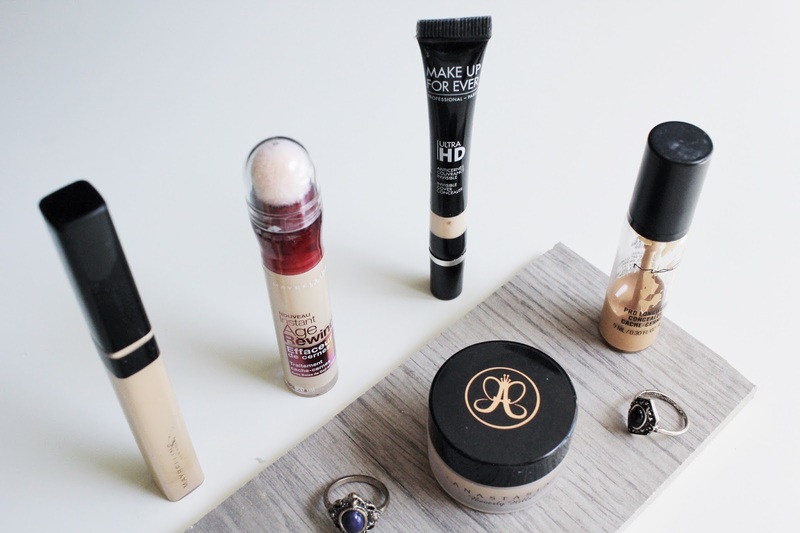 Lastly, I've been using the ABH Concealer every time I do my makeup. I use it to carve out my eyebrows. It's super pigmented and covers up any mistakes I may have made when filling in my brows. It's really soft and creamy. I picked this one up a while ago and there's barely a dent in it. With that said, I'd say a lot goes a super long way. What's your holy grail concealer?